Guest speaker, Quiller Barrett, President of the Croquet Association, gave a lively and interesting talk at the Anniversary Dinner on 3rd March. He suggested that we should try to encourage younger players to join our club as the average age of croquet members across the country was rising steeply. About 40 members and friends enjoyed the convivial evening held at the local golf club. It was good to meet up after the miserable winter and we all looked forward to being back on the lawns before long. Judy Anderson passed away peacefully at Bedford Hospital on April 22nd. She and her husband Tom were entirely responsible for the birth of Letchworth Croquet Club. As East Anglian Development Officer for the Croquet Association she bludgeoned the Letchworth Garden City Corporation into allowing the use of land at the Par 3 Golf Course in Willian Way completely free of charge. She then ran an open evening at Plinston Hall which attracted lots of people and 40 signed up for the first course which Judy and Tom ran over a 6 week period. They then helped us form a club and get it off the ground. Judy has had spinal problems for many years and this finally got the better of her. We have heard from her son that ANNEKE WILCE has died The funeral was at 11.15 am on June 13 at the Central Methodist Church in Letchworth. Anneke joined us in 2009 and very much enjoyed her croquet for two or three years. Sadly, failing health forced her to retire from the game. Our Quiz Night was attended by more than 90 keen players. As well as a very enjoyable evening it raised more than £1000 for club funds! Thanks to Sue for organising, to Jeremy for being Quizmaster and to Carol for a fantastic supper. Court 1 has just been moved into its new ‘winter’ position, which is slightly offset from the regular playing area and is approximately 80% of its normal size. This has been done to allow the usual hoop hole positions a chance to rest and recover over the winter and also allow us to continue working on the boundaries from time to time. Apart from possibly resetting hoops when the rabbit runs become too obvious, the court will stay this size until February or March. Court 2 is now open for play. Like Court 1, it is slightly smaller than full-size but should be perfectly adequate for play during the winter. Hoop holes have been set for both AC & GC games. The reseeded areas are settling in well and will continue to thicken over time. However, they are more fragile than the established lawn so it would be appreciated if players take extra care when playing on them. That said, the surface in general at this time of year can be easily damaged by a miss-hit mallet swing - it happens to all of us - but please be especially aware of this when playing near hoops. Our only other request, apart from hoping that you enjoy your croquet throughout the winter, is that you avoid walking on the lawn when it is covered in frost. Nigel Polhill won the Letchworth A Class weekend beating Simon Hathrell 2-0 in the final. He was presented with a trophy and two Mars bars for completing two Triple Peels. There were 24 players on a pleasantly warm afternoon.The leading individual was Ian Mantle, and the winning pair were Tracy Martin and Colin Gregory. Congratulations to them and thanks to all for making this a successful event as always. Those of you who have recently been wondering why the door to the shelter was getting more and more difficult to lock may be interested in the attached photo. 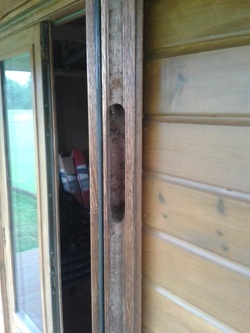 David Mathews took the metal lock strip off the side of the door to investigate what might be causing the problem, and found that the channel inside was almost completely blocked with what can only be described as ‘bee debris’. Dust, muck, even a bit of old honey wax were all stopping the lock from engaging. If your photo viewer allows, zoom in to see how hard that bee must have been working ! After a quick clean out - and a slightly longer session persuading everything to go back together again - all should now be operating smoothly. As you may be aware, David keeps bees of his own (at Standalone Farm, not Muddy Lane) and they have apparently had a prolific summer, so get in touch with him if you’d like some genuine Hertfordshire honey. 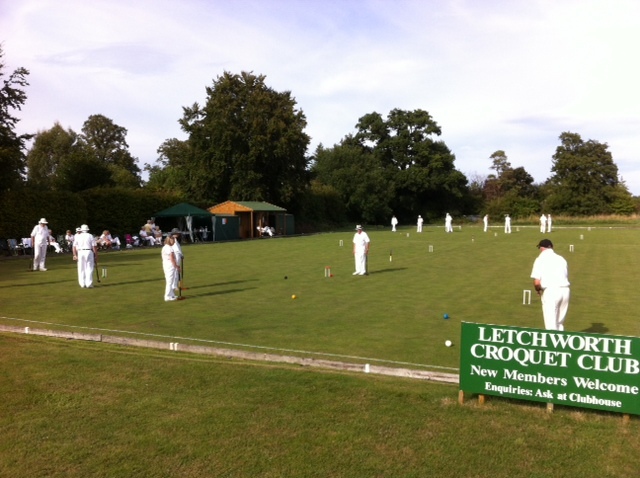 Letchworth hosted Cheltenham in their GC Inter-Club Championship match on Friday 19th July, a relentlessly sunny and hot day. Letchworth won 4.5 to 2.5, the doubles leg having been suspended at one game all at lunch time and not resumed. Congratulations also to John Hall, Keith Rhodes, David Tutt and George Woolhouse who won the first round match in the Mary Rose competition against Cheltenham 4-3. The next round match will be against Wrest Park on August 7th at home. Success too, for Robert Staddon who won the Edward Martin Cup, our singles GC tournament in May. The Grass Roots GC tournament has resulted in a first round win for Trish Noble followed by Bridget Sheldrick, Vernon McClure and Ann Baker. Congratulations all. Trish and Bridget will go forward to the National Final at Ashby Croquet Club on 7th September. Congratulations to Janet Matthews and Bridget Sheldrick who won our GC Fun Doubles Tournament and to Pam Stark who achieved the highest individual score of the afternoon. David Russell was thanked for his seven years as the EACF GC team captain and prizes were presented by Colin Gregory, Club Secretary, who organised the tournament expertly, as always. The restriction on jump shots has now been completely lifted. Jump shots are now allowed in all matches, competitive or friendly. The lawn has recently been showing good signs of recovery, so thank you for your patience over the last few weeks. Although we are still working on some of the bare patches, the surface is more stable than it was and should be able to cope with a well-played jump shot. If you are in any doubt after all this time, extra hoop holes have been made at the far end of the lawn, past the end boundary, specifically for practice. The lawn is now open and new hoop holes have been set. GC holes, nearer the tennis courts, have been initially marked with a white flash. As a gentle reminder: - each hoop is marked at the top of one leg with the court number (1 or 2) above the hole number (1-6) - this number should face the tennis court side of the lawn - court 1 is nearer the car park; court 2 is further away - please don’t bang hoops until the top of the carrot is level with the grass - just enough to let a ball pass through - GC hoops are NOT interchangeable with AC hoops. The GC ones have protruding top bars. All the hoops have been repainted but the coating is rather brittle and will remain so for some time until it has fully cured. So when carrying hoops PLEASE ensure that you keep the separated so they don't clang against each other. If you hear or see someone clanging hoops together please stop them immediately before they do irreparable damage. Re-coating is expensive so please treat the hoops with respect. Also please treat the lawn with care until it really starts to grow again. It will be very easy at the moment to gouge the surface and take a divot, and be left with a sandy scrape and no new grass. There are also large sandy patches which people should avoid standing on if at all possible. For friendly games, just move the ball off to the nearest point and play from where the grass is looking healthier. 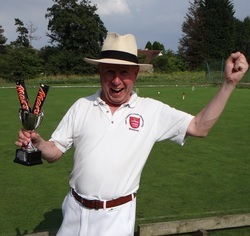 The Croquet Association has awarded the Apps Memorial Bowl to Nick for the most improved male AC player in 2012. Congratulations! The Autumn Lawn Renovation programme took place on October 13th. Thanks to all the club members who helped. Although causing a period of disruption to play, this work is essential to improve the health of the grass. It also enables us to do some general ground levelling and repairs over and above the regular maintenance sessions. This sort of work would be unaffordable for a club of our size if we had to use external contractors, so we are very dependant on our own efforts.